Having worked many live broadcasts for radio I have seen many setups. Our setups have ranged from the complex to the most simple. A wide range for sure. We have broadcasts which require four or more mics down to simple “call-in” type hits using the Tieline Report-IT application. Now we put together something for the simple end such that any air talent can set it up. associated cables and 25′ extension cord. The speaker and headphone amp are items we had in house that were either spare or used in other applications that are no longer necessary. 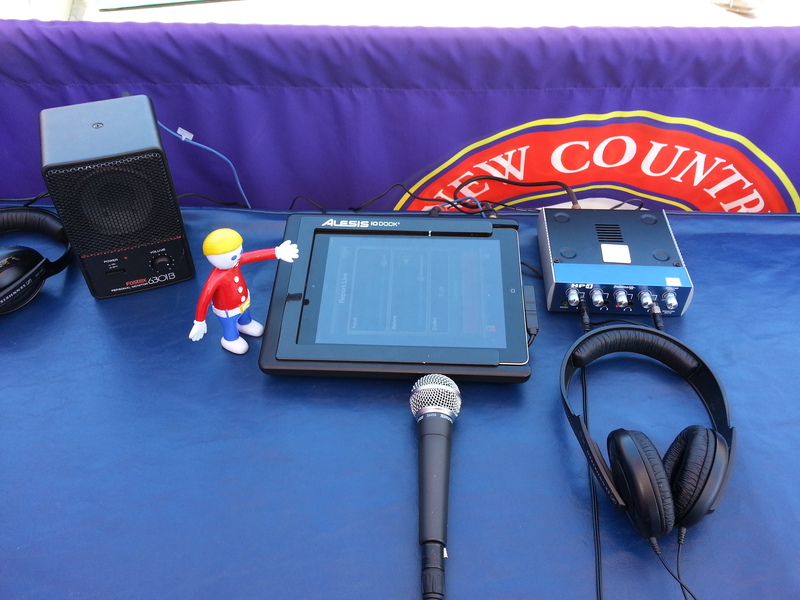 Mr. Bill was along to assist in the setup and make sure everything ran smoothly. The headphone amp is used just in case of a two person setup, and noted later as an interface to mono the audio feed. We have found in many cases if the environment is not too noisy a guest does not use, or need, headphones. It adds additional gain for the deaf air talent, too. If the air talent does not need the amp, just plug into the headphone output of the I/O Dock. We did find in another broadcast test that the iPad will smoothly transition between 4G LTE wireless and WiFi connections. This was discovered when checking out a new site. A little added bonus. After doing an initial broadcast and testing, we discovered that the Alesis I/O Dock is designed around two independent channels. Input 1 is the left channel and Input 2 is the right channel. These channels are independent throughout the system with no mixing or mono-button capability. The Tieline Report-IT application, being a mono or one channel application, only “saw” Channel 1, so a mic plugged into Channel 2 did not feed audio to it. I voided the warranty. Since the device only cost us $177, I decided to open it up and modified the I/O Dock. This first modification, and I have others planned, was to make sure two mics fed the application. No schematic was available, but I was able to research the chip-sets used and found the AD-DA (Analog to Digital/Digital to Analog) converter chip. Armed with the pin-outs I used my oscilloscope to trace the signal at that point with the goal of making sure the summing occurred after the pre-amplifiers for the inputs. I located a convenient locations, soldered in a jumper, and all was good. An instant mono, or summed, source for the iPad. This modification does not affect the headphone or main out feed of the I/O Dock, just the feed to the iPad, so each channel is in separate ears of the headphones if plugged directly into the headphone outputs. The Presonus headphone amp has a mono button on it, so the device acts as a nice interface for the picky talent. Return audio from the Report-IT application is not affected and feeds both output channels. I do plan on modifying the modification to included a switch so at a push of a button a mono signal is produced and feeds all outputs. Where and how to implement this switch is the tricky part as there is not a lot of space to add it to the I/O Dock, but I will find a way. Another added benefit of this setup is to allow recording on the iPad using either a third party application like WavePad or even the Tieline application for feeds later. Using WavePad the talent can record and do basic editing, and once complete, email the audio clip back to the studio. If using Report-IT the talent can record a report and either feed it down the connection or, if FTP is setup, upload to the studio. We are currently researching ways to incorporate the FTP feature in Report-IT such that we can upload clips with specific file/cart numbers and have them automatically import them into a RCS NexGen log. Why not just use a mic adapter and Report-IT on a phone or iPad directly? We do that, too. In this setup the ease of incorporating two microphones was ideal. In addition the comfort level of the air talent increases as they have that physical something in front of them. Some of our staff has embraced this new technology, but others seem to be less forgiving. As we easy them into it, we make it simple and functional for them. Soon they will be able to run out with a setup on their own and not think twice of it. Getting things done. That ‘s what it is all about. Alesis makes a product called the I/O Mix which is a 4 channel mixer. We are looking into that, but this is taking things backwards. There may be a use for such a setup in the near future. For a more complex setup, Mackie makes the the DL608 and the DL1608, 8 and 16 channel, mixers for iPad. These are sweet as they incorporate the features of the Mackie VLZ series of mixers. I know of a station that uses this setup for their NFL broadcasts. As the technology and connectivity continues to improve, applications like Tieline’s Report-IT simplifies the ability to provide for quick, live broadcasts, and news gathering. We are always looking to simplify and utilize emerging tech to our advantage. The package seen here does not cost that much and the flexibility makes it more desirable. The elimination of bulky and confusing mixers appeals to air talent and promotions alike. Improved audio quality for “call-ins” over a standard cell phone call makes us stand out over the competition. Coming up on a month out and I have not even done a recap of the NAB Show! Well, that’s because most of the wanderings I did had to do with actual business this year. Odd, but true. I really could have used a third day this year as I did not even make it to the South Hall!!! Nor did I visit my friends at GoPro or DJi. Now that is what I call busy. What I did see was the cool stuff that you probably already know about through trades or hearsay. I like the new Nautel GV series transmitters. Harris is also looking good and stepping up a bit. This time I was actually talking STL equipment with them. The Alliance had their share of stuff, and all they need to do now is make transmitters since they seem to do everything else. As you can tell if you have read this far, nothing really jumped out at me at this point. I did have a nice demonstration of the Tieline offering: the Codec Lounge. A very good concept and we discussed possible ways of making it even better. Maybe I’ll get a demo/beta version to try out. I also heard about the SAS Virtual Console of which I will get to see shortly. I have some ideas for this. Along the lines of STL’s (that’s Studio to Transmitter Links for the acronym challenged) I’m seeing more in the IP transport arena. We are actually researching upgrading our aural STLs to an IP based system for two reasons, flexibility and flexibility. Audio over IP on a private network is just fine these days and for a backup to anything else it is great. With all the data we push around with IP based remote controls and addressable transmitter equipment, the added flexibility of IP makes life much more simple. For audio I was looking a the Tieline and Worldcast gear. As for a system we are looking into the licensed 8, 11, etc. Gig radios and broadband data. Let’s see how that pans out over the year. As we move forward what did you see that excited you at the show? Overall, not too much jumped out at me. Yet, on the face-to-face time, it was a very good show. Maybe next year I can get an extra day to see the other world of cool stuff in the South Hall. A couple of months ago I posted on Goggle+ for suggestions on how to enter the world of Linux. I was enlightened on the responses and jumped in. I installed VirtualBox virtual machine software on my Windows 7 desktop and had at it. First I downloaded Ubuntu. The 64-bit stable release 12 did not take too well, so I went with version 13. Install went well. My impression after starting to use it was a feel between Mac OS and Windows. A mash up, if you will. The package came with LibreOffice, so I briefly poked through that. I found the standard games. I used the standard browser. All worked. I when decided to download the Chrome browser as a test. No problem there. I still have much to explore as Ubuntu provides a lot of stuff in their package. One thing stood out that annoyed me. The scroll wheel on the most does not work. At this point I did not know if it was a VM issue or Ubuntu. I guess I’m used to that particular mouse feature, so it stood out. After this quick study I looked for the other suggested Linux build, Debian. There were two routes to take on this, and being a noob (yes I just used that word), I downloaded some full ISO image. Thinking I did not need this running on a virtual machine I looked at the options again and found a network build/install. I downloaded that and installed it. While Ubuntu has links to apps like a Windows desktop, Debian gave me a blank desktop with a drop down menu. I poked around and was getting comfortable very quickly, though I still have tons to learn. Thinking I know enough to cause trouble I began to surf the web using the default browsers. Ubuntu’s seemed a bit clunky and I decided to jump to Chrome. The Google browser installed automatically and ran well. In Debian the default browser was just like Firefox but with a different name. (I’m now sitting at my machine, the browser is Iceweasle.) It was quick and easy to use. To be fair on the comparisons I downloaded Chrome. Debian did not install automatically. It downloaded an install package which made me learn how to install the package, which I did figure out after one false start. That was not all, I had to find where it was installed and it did not add a shortcut or link in the menu. I poked around the file system and quickly found the file to run. I learned how to add it to the menu list which was satisfying. Performance was similar to the default browser, so the jury is still out on which one I like best. I plan on looking for the best or proper antivirus software to run next. I don’t want to assume all is safe like Apple does. More research needs to be done as I continue on. Both versions of Linux came with Libre Office, so I get to play with that. I want to search for more applications that may be useful, too. Any suggestions are welcome. I will follow up on this post add I continue my journey into the Linux world. There is something very satisfying when helping a fellow engineer solve an issue. It is also nice to think that a manufacturer would recommend making the contact due to past experience with their equipment and associated equipment. In this case Nautel directed said engineer to make contact since I am familiar with the NV line of transmitters and the Burk ARCPlus line of products. In fact, the Nautel tech sent me the initial email, then everything flowed from there. Apparently, and I knew this, there is a multiplier issue with Burk and meter readings of the Nautel NV series transmitters via the PlusConnect device. A while back I noticed after a firmware update that I was no longer getting the proper Reflected Power reading from my transmitters. I have 2 NV20s. No changes of decimal places seemed to make a difference. Working with Burk technicians we determined there was a multiplier issue withing the system. As a work-around we used an unused channel to take the reading, and then used a Virtual source on the channel on which all my units displayed the readings (ARCPlus, AutoPilot Plus, etc). This solution worked and all was good. I assumed that any future update would correct this issue. Then came this contact. I immediately recognized the situation as being similar. Reflected Power reading and this time Reject Power. I suggested to do the work-around and see if it made a difference. I was glad to hear from him this morning that it did, but he had another channel that was doing something odd, the PA Temp reading was a 4 digit number and changing the decimal places in AutoLoad made the reading go out of range; the dreaded 99.99 reading. As this was not a channel I normally monitor, I gave it a shot to see what I would get. Sure enough the raw reading was coming back as 3613 and 3684 on my respective transmitters. I thought that this was a good number, but the decimal place was off, so I changed the decimal setting in AutoLoad. Sure enough the ARCPlus was now reading 99.99! I tried a decimal setting of 000.0 from 00.00 and then I got a -999.9! Sure enough there is an issue with a multiplier. In this case it was TOO BIG, so I decided to take the raw reading on a spare channel. I then changed the metering channel I wanted to read to a Virtual source and divided the raw reading by 100 which displayed the result of 36.13 for the first transmitter. As it is a temperature in unites of Celsius, this reading on a reject is good. Phew. Of course I called Burk and filled them in. Off to the programmers to see what is up. In any case, if you have a setup like this and your reading is too low and you know what it should look like, the solution is to create a channel that is a virtual source. In my case the expression entered: M256*1000. Translated to take meter reading on Channel 256 and multiply by 1000. On the PA temp the expression entered for the virtual source: M255/100. Translates to take the meter reading on Channel 255 and divide it by 100. If you have this issue, fix it by doing this manual multiplier/divider thinking. All you are doing is what the program should be doing when changing the decimal places setting. Burk is aware of this issue. As I copied my Nautel contact, they are aware of this issue, too. Happy troubleshooting! I just wanted to solicit any thoughts on the the future of Radio. Television is OK, too, but I work radio. I want to know what you think about hardware, programming, and how they will interact in the future. Send email or reply to this blog. Email: bill at eisenhamerengineering dot com. Over the last few months I’ve been thinking about this subject. Seeing some of the recent moves by companies like Cumulus makes me more sure of what I see. Clear your mind. Think outside the world as you know it. If you want to discuss and/or collaborate, contact me. This should be quite the exercise. Traditionalist need not apply.